Leadership positions can now be configured to automatically assign access rights to the users who currently hold that position. You can now control who receives TroopWebHost communications based on their current leadership position or by selecting them individually. Individual members can sign up for the TroopWebHost newsletter and to be notified when their subscription is up for renewal. A new Recharter process allows you to track which members were included in each year's recharter. The Photo Gallery now allows higher resolutions up to 1200 pixels per side. After completing a Booth Sales event you can now produce a summary of the products sold at that booth. 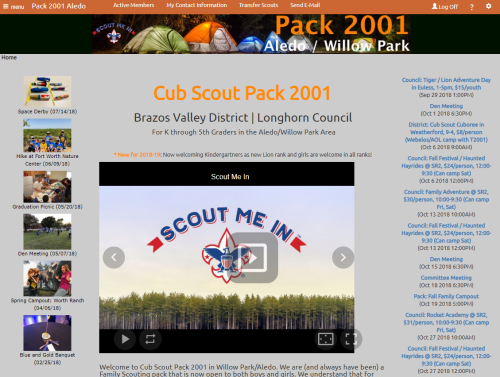 Pack 2001 of Aledo, Texas! This pack shows how to use Custom CSS to create a distinctive look for their TroopWebHost site. They also showcase a recent BSA video that highlights the exciting changes happening to the scouting program. Add in an extensive photo gallery illustrating their last four year's of fun, and you have this month's Website of the Month!